The Manfrotto 685B NeoTec Pro Photo Monopod with Safety Lock features the innovative NeoTec rapid opening and closing mechanism. The leg opens up by simply pulling down on it, and automatically locks into any position, with no screws, knobs or levers to tighten. The 685B also sports a safety lever that prevents accidental deployment of the locking release mechanism. To close the monopod, simply activate the safety lever with the 'pinkie' finger, which then allows the grip action handle to be depressed. The lever is simple to operate while still maintaining one-handed closing operation. The heavier the weight pushing down on it from above the more locking power this innovative mechanism exerts. To further improve the single-handed performance of the NeoTec Monopod, Manfrotto has added a lightweight rubber foot pedal to make opening or closing a snap. To increase the height of the camera, simply step on the pedal and lift the monopod to the new position. For storage and transportation, the foot pedal folds away against the bottom leg section. Protective foam leg-warmer on the bottom leg section to provide protection against the elements and offer a comfortable grip during transportation. Suction cup foot for extra ground support and increased grip. Box Dimensions (LxWxH) 31.0 x 4.0 x 3.0"
685B NeoTec Pro Photo Monopod with Safety Lock is rated 4.4 out of 5 by 131. Rated 4 out of 5 by Frosty from Use it Daily As a Real Estate Photographer, my Manfrotto monopod is in my hand nearly every day. This is my second in three years - I wore the first one out. Biggest challenge is replacing the foot if you lose it (which can happen easily when tramping shooting landscape around up-scale homes or on large acreage). It costs a fortune to replace this part. Another challenge is that the teensy tiny screws come loose easily and if you lose the screw or the nut, its impossible to find them or replace them. An associate and I actually harvested parts from a retired Manfrotto monopod to maintenance our equipment as needed. That aside, it's a great tool! Rated 5 out of 5 by Anonymous from Excellent Monopod I use this with longer lenses in situations when shutter speeds are dropping too low for that specific lens, eg the 135mm f/2.0, which needs at least 1/125 sec or more to use handheld. 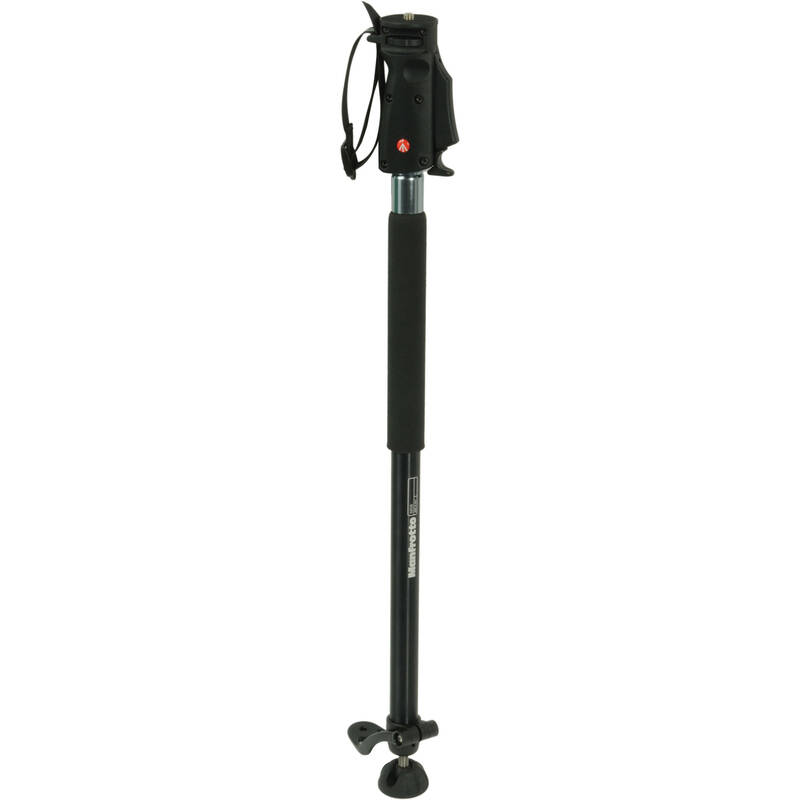 With this monopod, I would not hesitate to use this lens at 1/60 sec (if there is no subject movement that is). It is so easy to adjust the height - simply squeeze the handle at the top (there is a safety latch to stop accidental movement) and then move it to your new desired height. A monopod is no substitute for a tripod but is much easier to carry around and set up than one. If you are using very large heavy lenses all the time and you need to still move around a lot, then this monopod will be great for that. Rated 4 out of 5 by Vibrant Photographer from great for wedding photography I bought this after I changed to longer prime shooting (85L, 135L) vs my IS zooms. I find it perfect for dark churches and receptions. The ability to quickly change the height I am shooting at made me have faith in monopods again. I pair it with a decent ballhead and L plate on my camera means I can quickly change camera orientation without changing my camera height. I.e. The camera is rotated ontop of the ballhead not the monopod head. it is also invaluable for fashion work, giving me the ability to physically move around where a tripod would slow me down. I only wsh it was more compact when collapsed down for trave usage. Rated 1 out of 5 by Anonymous from If it fails to lock, you're done I bought the 685B and, upon attempting to use it for the first time, I found that the lower extension tube would not lock in any extended position. I called Manfrotto and eventually got someone to call me back to discuss the problem. The upshot of the whole affair is that the equipment is UNREPAIRABLE for this problem. Once the lower unit is fully assembled it cannot be dis-assembled for repairs according to Manfrotto. This lack of repairability is a serious liability. Rated 4 out of 5 by Mike E. from Very easy to use I received it on Friday and used it today covering an event. Being able to easily move it up and down without bending over was great. Very solid feel and no problem holding my Nikon D3 with 70-200 f/2.8 with a 2x tele extender. The bottom foot rotates to be able to extend the spike. Becuase of this you really need to hold this harder since it will tend to rotate. After getting used to it for a bit, I had no issues. The tubes also rotate, so if you like to use a monopod to hold your camera in teh air or a flash this is not for you. It will just keep swinging to the center of gravity and you can't turn it. Rated 5 out of 5 by Jason From Duluth from Didn't Realize How Nice a Monopod Is I will be using this product to lug my very heavy Nikon D3s, Nikkor 70-200mm f2.8G VRII, Pocket Wizard Flex, and SB900 around at weddings. I've only experimented at home, but I already know it will work wonderfully in the real world. One thing I don't like about it is that it's quite difficult to extend (perhaps after a few more times using it it will loosen up thereby making it easier to extend). I'm uncertain why there is a hand strap. I have one hand on my camera and the needs to be free to work my lens and work the monopod. I was skeptical at how difficult it may be to use, but I find that it's much easier to use that anticipated. Rated 1 out of 5 by Six Romeo from Poorly made internal components I've had 2 of these monopods in my possession now and neither one of them ever worked properly. The bottom segment either fails to lock or won't retract. Not after many uses mind you, we're talking right out of the box! The bottom line is that this is a very cheaply made product that would be over priced at half of what they charge for it. What good is special aeronautical grade aluminum alloy if the internal components are made up of plastic tinker toys?? This monopod is like a Ferrari with a Pinto engine. A beautiful worthless piece of junk. Is it possible to mount a base (3 legs) to this monopod ? Which one ? What is the best compact head to use with, for photography mostly and video ? Manfrotto does not make an accessory for that monopod like the Manfrotto 678 Universal Folding Base. The link for that is, http://bhpho.to/1brbWBPThat base will work on the 679, 680, 681 and the older monopods, 3016 and 3018.There is not third party item that I am aware of that will work with the 678. What are the main functional advantages of this model over the less expensive 334B automatic monopod? Many thanks. The main difference I can see is that the Neo Tec does not have the locks on the leg sections. All you have to do is step on the foot and pull the monopod to increase length, so it's very quick to bring your camera to eye level. I use mine while hiking so that is a lot more convenient than having to loosen the locks and adjust the height every time I see a shot that I want to capture. And it seems to hold just as well as if it had the locks. I hope that helps!